Jay Z’s got 99 problems and his freestyle is one. On Saturday at his closely-watched “B-sides” concert — which ran exclusively on the hip-hop mogul’s music streaming service Tidal — Jay Z responded to critics with a sharply-worded freestyle rap. During one verse, he connected Tidal’s troubles with the deaths of Trayvon Martin, Mike Brown and Freddie Gray — unarmed African-American men whose tragic deaths made international headlines. “You know when I work, I ain’t your slave, right? You know I ain’t shucking and jiving and high-fiving, and you know this ain’t back in the days, right? Well I can’t tell how the way they killed Freddie Gray, right? Shot down Mike Brown how they did Tray, right?” the rap legend said. But nationally known scholar, Boyce D. Watkins, Ph.D., who frequently speaks out on issues involving social justice, tells TheWrap Jay Z may have gone too far. The rap legend’s freestyle also included a verbal shot at Google for apparently trying to buy him out, and YouTube for what he perceives as shortchanging artists. Jay Z went on to suggest Tidal faces additional scrutiny because it is black-owned. And he lashed out at African-Americans for buying Apple and Nike products, but dissing Tidal. Watkins, a Scholar in Residence in Entrepreneurship and Innovation at Syracuse University, believes Jay Z’s rap was self-serving and misguided. 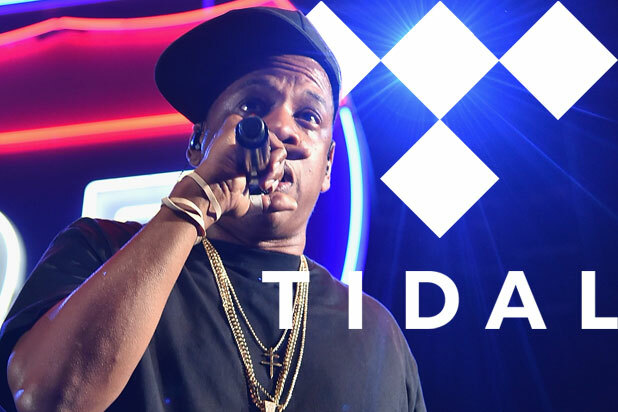 Jay Z bought Tidal in January for a reported $56 million. Since then, it’s been besieged by branding problems, bad press, layoffs and the departure of CEO Andy Chen. The streaming service was originally billed as being created to put control of music back in the hands of artists. Its relaunch in March — by some of the richest musicians on the planet including Madonna, Kanye West, Beyoncé and Rihanna — arguably hurt the brand’s image. The streaming service kicked off with two subscription tiers: a basic membership for $9.99 per month and a $19.99 membership for better sound quality. While Tidal has promised exclusive content, some consumers say that’s not enough, especially when they can use “freemium” streaming services like Spotify. On Monday, Beyoncé and Nicki Minaj dropped the surprise music video for “Feeling Myself” exclusively on Jay Z’s service. Within hours of its debut, the footage had been ripped and posted on other websites, reinforcing the question of whether Tidal is worth the cost. While Spotify has a free option, and Pandora generates free custom radio stations, Tidal is just an app that streams music — for a hefty price, Crupnick explained. Jay Z did not respond to TheWrap’s request for comment. But as Tidal’s struggles mount, Watkins believes they have little to do with the struggle for civil rights, despite Jay Z’s protestations. You can watch the video below of Jay Z’s “B-sides” concert. His freestyle rap is at the 17:18 mark.